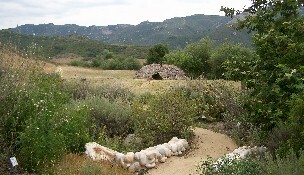 Santa Monica Mountains, located in Newbury Park, is a beautiful part with a wide variety of paths. 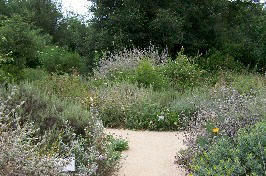 This park is especially beautiful because of the native plant garden and Chumash ap that are maintained just off of the main trail. This hike lasts approximately 2 1/2 hours long. Well marked paths and hills. Facilities available. From the 101 in Newbury Park, exit at Wendy Dr, turn left onto Wendy Dr. and continue to Lynn Rd. Turn right onto Lynn and continue to Via Goleta. Turn left onto Via Goleta and continue to the last parking area.